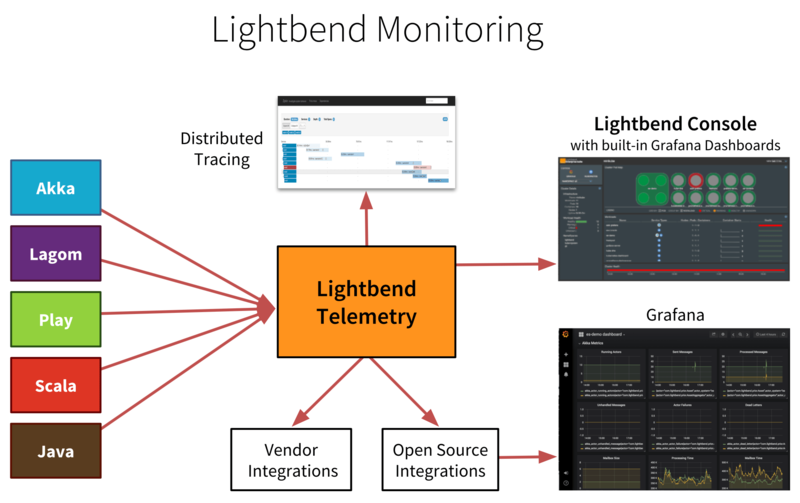 Telemetry, part of Lightbend’s Intelligent Monitoring feature set, is a suite of insight tools that provides a view into the workings of our distributed platforms. This view allows developers and operations to respond quickly to problems, track down unexpected behavior and even tune your system. As a result, you can deploy your applications to production with confidence. As you can see above Monitoring has two essential pieces; Telemetry (Cinnamon) and Lightbend Console. This documentation is focused solely on the former. Telemetry makes it possible to gather metric, event and trace information from Akka, Scala, Play, and Lagom based applications. The information is transferred to various backends. The rest of this documentation provides an overview of Telemetry and explains how to get started, configure and run Telemetry in production. Lightbend Telemetry requires a subscription from Lightbend.